I really do not seem to be going after the pages of my new sketchbook enough. There was just one from early in this month. 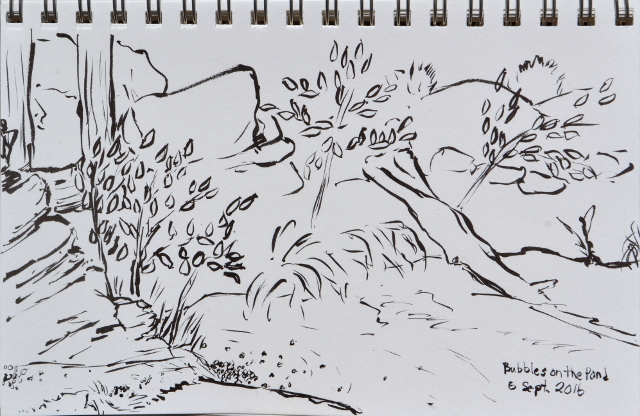 Stopping by one of the pools in Matilija Middle Fork. The local Sierra Club chapter has hikes every weekend and this weekend I joined both. Saturday was a cleanup of the Lizards Mouth area. It was a bit hot and we only had three people total for it. Robert Bernstein's photos from that are here. Today is expected to be a bit hotter without a chance of an ocean breeze, but we have more at the meet point at the bank and a few more meeting at the trail for nine total. There is a promised pool at the turn-around, if there is any water. We expect no water on the way up and indeed, we start off across a very dry Manzana Creek to get to a lot of south facing hiking. Trees in the canyon as we get started. That first crossing starts off a long section of hiking on the north side of the canyon. 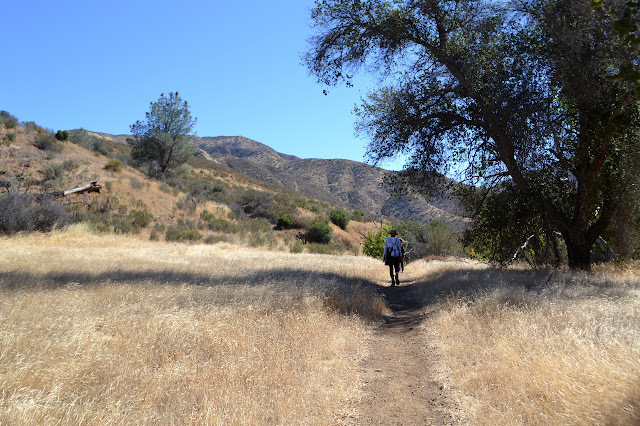 Initially, there are a few trees to offer shade, but eventually, we are out on the slopes in the chaparral and the sun. We can spot trails below from those who did not manage to find the higher trail. The trail is getting so clear now that those must be maintained more by people who just like walking through the creek area than by lost people. There are sycamores down there hinting at a bit of water hieing below. A few trees on the way through the dry grasses. I was the ripe old age of 14 in 1991, so my first trip up to Mount Whitney was not my own plan or execution. Instead, it was part of the intermediate backpacking unit at Camp Mountain Meadows. Or at least slightly higher than beginner. It may well have been my third backpacking trip ever and the previous one did not go entirely to plan. The first one was when I was 9. This one also did not go as planned, but in two ways inconsequential to getting to the goal. 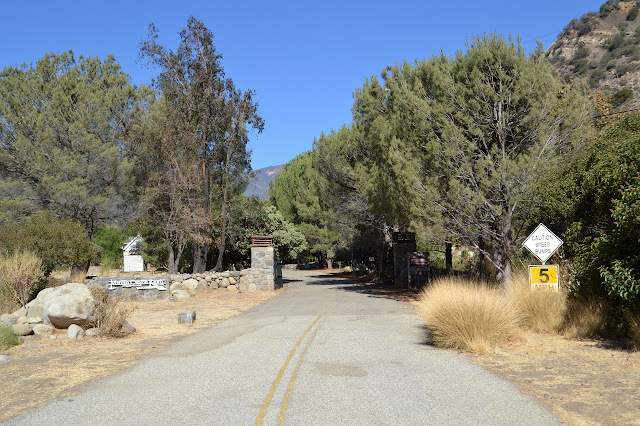 First, permits had not been reserved for our group, so the original plan to go in at Onion Valley and proceed south had to be scrapped when walk-in permits could not be obtained for a group the size of a Girl Scout Camp unit. Instead, we camped out at the Cottonwood Lakes backpacker camp at the trailhead (which I remember being quite crowded) and Klikitat got up at 4AM to sit next to the ranger station to be first in line when they opened. I think she said the second person in line came at 6AM. We got our permits. In case the suspense is causing stress, the other way in which the trip did not go as planned is that we packed fresh vegetables for the first two nights. Unfortunately, broccoli will not last to the second night and will take the rest of the vegetables with it. We had to carry spoiled vegetables with us for the rest of the trip because Leave No Trace does not allow one to bury that. I include this because one more person learned this the hard way on my trip up Mount Williamson. He did eat it, but it was not a pleasant experience. It does not even have to be very hot. My cheese did not even sweat tucked in under my basic blue mat while the broccoli next to it fermented. The map for Cottonwood Lakes to Whitney Portal via New Army Pass and Mount Whitney. Click it and zoom it and it will make a lot more sense. On the map, our rough route is marked in purple and camps are dark blue dots. I do not remember where we camped in the middle, just the first, penultimate, and last nights. I tried to extrapolate the middle, but came up with two spots. That makes five nights for a five day trip. But the route is correct. Day 1: We climbed. The climb was not memorable, at least not yet. We got to one of the lakes along the way. I am fairly sure we did not get up to one of the higher lakes and I have memories of more complications on the map than can be seen now. Memories are so convoluted. Seems to me we managed some route finding difficulties around one lake. Considering trails go everywhere up there, that is both silly and possible. We were expecting some soggy bits up ahead when we stopped. 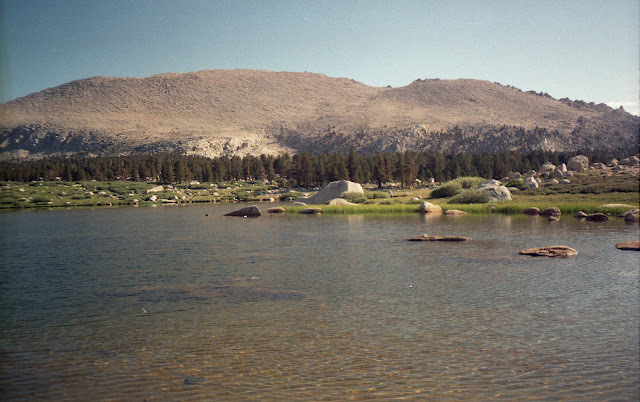 One of the Cottonwood Lakes, quite possibly #3, scanned from my small set of photographs from the trip. After the distant waterfalls, I started thinking of my local falls. How are they doing? Well, Mission Falls only runs in a storm, so that does not count. Tangerine has water above and below but never seems to have water moving between. The hard rock layer that forms the top of a waterfall is supposed to bring out the underground water, but it must have let a tunnel form somewhere. San Ysidro is wet, but you practically have to reach out and touch it to be sure of that. 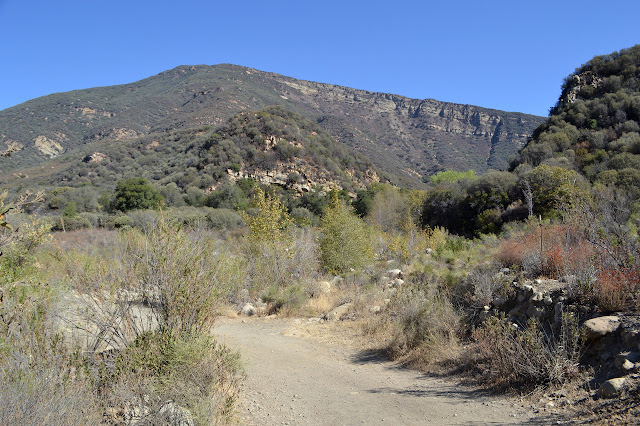 Maybe it is time to visit something with a lot more acreage behind it like Matilija. Expecting the holiday would be a madhouse, I waited to the next day to start. And with a long, looping drive, I got to a place that really is not all that far from home. My start time is leisurely, but there are only two cars in the lot and one seems to belong to a guy picking up garbage nearby. Just stroll right past the ranch to start the journey. There is a sign about how your right to pass is revocable helpfully implying there is a right to pass by default. Packed up, including plenty of water for a hot day, I set off. This means walking right down the middle of the ranch. I keep to the left to avoid wearing down my shoes on the pavement. The peacocks, the most noticeable wildlife in this refuge, are starting to get little tails after the last shed. Past the first ranch, the road dips to a creek crossing and it is dusty. The second, larger crossing is dusty as well. Never a good sign for what lies upstream when looking for waterfalls, but not the worst sign. 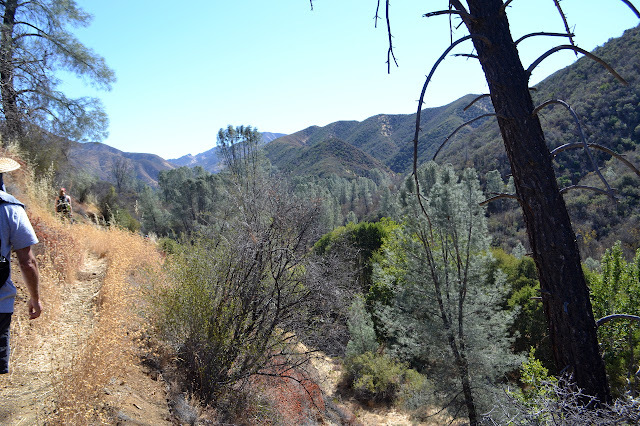 So I pass by the start of the Upper Middle Fork and Murietta Trails. The signs are intact, but the maps that were provided with them are largely missing. Approaching a very dry creek crossing below the cliffs of the Upper North Fork.